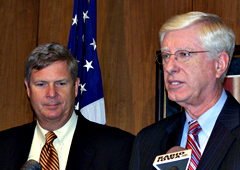 U.S. Ag Secretary Tom Vilsack joined Iowa Attorney General Tom Miller today in pushing for a new federal agency that would oversee banks and mortgage lenders. Miller says the proposed Consumer Financial Protection Agency is something that would help states. Miller says the rules and regulations the agency would create would not pre-empt state laws, so state could still experiment and adjust the rules. He says the state would be able to enforce the federal rules and that would create a “wonderful cooperation’ between the state and federal government. Miller says banks don’t want to see the agency created. “There’s a huge fight about it and the fight is being led by the national banks, the big banks, and they’ve convinced the smaller banks to fight with them. Even though the smaller banks, like the banks in Iowa, do not have a lot at stake,” Miller said. Vilsack, the former Iowa governor, says the agency would prevent the many problems that have happened in the lending and mortgage industries. Vilsack says Americans are still paying the price for “weak regulation and financial instability, which is at the heart of this current crisis.” Vilsack says this agency will ensure that “future mistakes by a few will not do so much harm to so many.” Vilsack says the Ag Department is involved in 130,000 guaranteed home loans and that’s one of the reasons why he is speaking out. Vilsack says so many rural Americans utilize “pay-day” loan agencies and other entities that he says would now be regulated by the agency — which he says would protect against some of the high interest rates that the people are charged. Vilsack says he agrees with Miller that consumer protection needs to be focused with one agency. Vilsack says when consumer protection is involved in “the rubric of so many other departments, it is an important role, but it is not as significant as other roles and the attention and time and resources just (are) not dedicated in the way that American consumers need.” Miller says he has not yet gotten a clear signal on how Iowa’s congressional delegation might vote on the proposed agency.